This post is for moms. Whether this is your first baby or your fourth, I want you to read this before your baby’s first photo shoot. Chances are, you are sleep deprived, feeding your little one every 2-3 hours. You are also probably tired thinking about and taking care of the million little things that need to be done between the feedings. You are also recovering from the delivery and handling all the emotional and physical changes in your body. 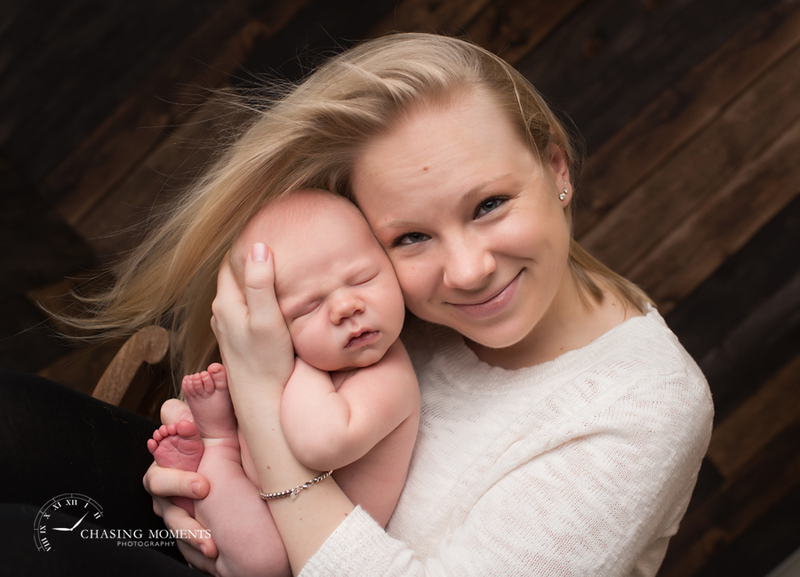 All in all, you may not be feeling quite picture perfect, rested and refreshed, and you may not be wanting to be in the photos with your baby.Â I am saying this not to put a damper on motherhood and those precious first days with Baby. It’s just my way of saying “I hear you! I know what it feels like!” and “It’s okay” because, realistically, many new moms know what I am talking about. So, if you are not feeling picture-perfect before your Baby’s first photo session and if you are not sure if you want to be in front of the camera, please consider this. 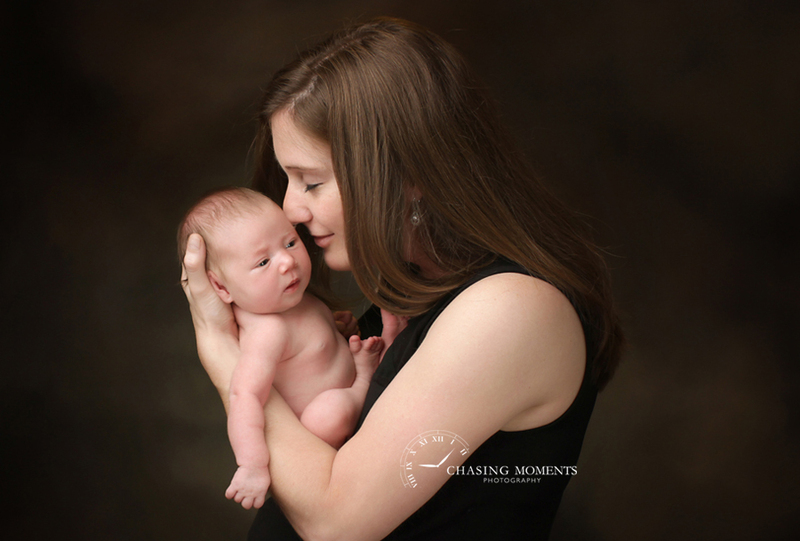 I have photographed hundreds of newborns with their parents. I use flattering angles, poses, composition and lighting to help you look your best. I will pose you, so you don’t have to worry about it. I will help you adjust your hair, hide your bra strap and smooth out wrinkles on your shirt before taking the shot. Basically, I will be there not only as your photographer but as your girl friend who wants you to look your best. I will also say silly things to keep the conversation light and do everything I can to help you feel your great, happy, beautiful self in front of the camera. I will help you position and hold your Baby just the right way, so you don’t have to worry about that in advance. You can bring your make up to the studio and take some time to powder your nose while I am photographing your Baby (this way, you don’t have to rush to do make up at home), and you can bring a special shirt for pictures and put it on for a few minutes of “on camera” time (and hang out in your sweats and your ‘cozy’ shirt during the remainder of the session). So, if you are in doubt, let’s take some pictures with you in them and then you can decide if you want to order any prints or not – ultimately, it is you choice. But this way, there won’t be any regrets down the road about not being in the shot with your newborn Baby. I absolutely understand that there are many valid reasons to focus a newborn session on Baby only. I just do not want the reasons above (sleep deprivation, exhaustion, not feeling your best, etcetera) to be one of them. Please feel free to email me at chasingmoments@gmail.com or comment here with any thoughts and ideas you have on the topic! I’ll be happy to elaborate on this post to include helpful links and expert suggestions or personal stories. On a personal note, I do not have any portraits of myself with either of my boys when they were newborns (oh, the irony!). The couple I do have when they were a little older are among my most treasured possessions from their baby-hood. So, going back and taking pictures with my newborn baby boys would rank high on my to-do list if I had a time machine! If the above makes sense to you, if you have been thinking in the back of your mind that you will have other things to worry about when Baby is born and you did not want to do a newborn session because it may be “too much”, but you are now may be changing your mind – get in touch with me! Email me at chasingmoments@gmail.com to book your session and I promise-promise-promise, these pictures will be lifelong treasures.